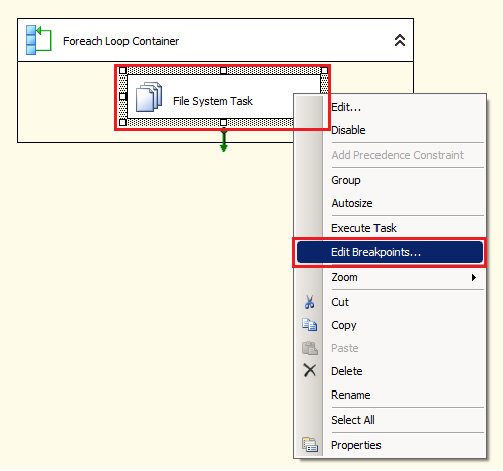 We have created a SSIS Package that takes the files from Source Folder and move them to Archive Folder. While it move them, It also add Time Stamp to file. Here is the blog post for the Package (Link) .In this post we want to watch the values of the variables at run time. 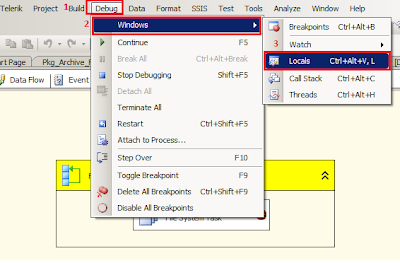 This can be helpful when we are getting some errors and we are not sure if the value of variables are changed while executing SSIS Package Or our expressions are evaluated correctly that we have written on one or more variables. By looking at the value of variables, It will help us to debug our package. 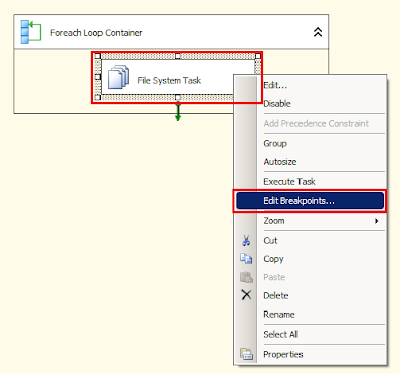 We will be using Break Point in SSIS Package to view variable values at run time. Here are the variable I have used in package. I have changed the values for VarArchiveFullPath and VarSourceFullPath variables. Expressions are written on these variable those should evaluate at run time and change the values of these variable. We can see that the values are changed according to the expression and we can debug if these values are correct according to our expectations, if not then we can go back to expressions and change them.